Creating new income categories is done through ADMIN ->School Setting Types -> Income Categories. Default Pricing for all of your categories are set in the Billing section-> Income Category Price tab. Click Edit on any Category you want to add or edit a Price – Enter the price and Update. Changing the price will reflect on new invoices only, previous invoices will not be affected by the price change. *Income Category Prices can also be overridden at the time Create Invoice is being used for an individual student. You do have the ability to enter a negative income category amount. Some studios will use these to display a discount on an invoice or to move a charge and payment from one income category to another. 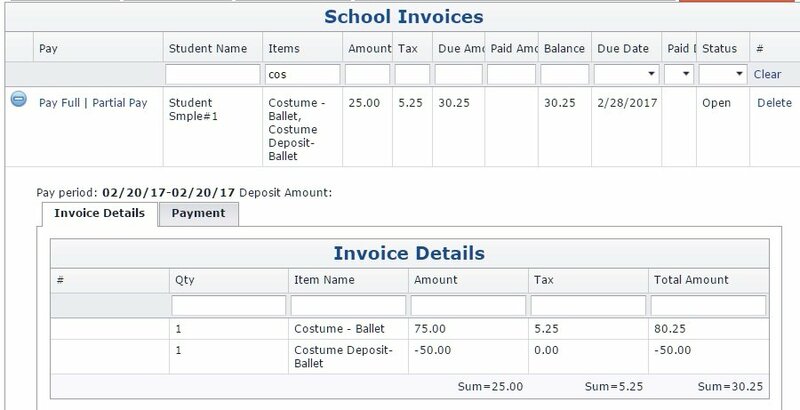 For example if you invoice for a Costume Deposit and then invoice for the full costume showing the costume deposit being a negative to show it applied on the invoice. For example: The studio charges $75 for the Ballet Costume and needs to collect a 7% tax. They already charged/collected a $50 deposit. In order to collect the proper tax for the costume, the full amount needs to be invoiced as taxable. You will then also apply a -$50.00 for the costume deposit to get the balance correct. !If you want to use negative invoice charge amounts you must be careful in how you apply payments. We recommend using Pay Full or Pay by Family Invoices (for balance) and the system will apply the payment correctly. If you are applying a partial payment, keep in mind you must distribute the negative amount too or the invoice will go to a negative balance and stay open.